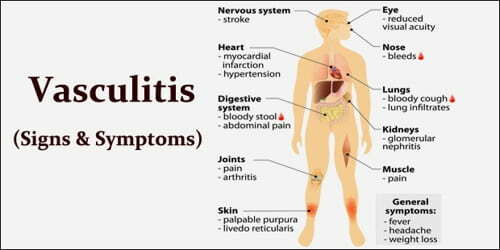 Definition: Vasculitis (also known as angiitis and arteritis) refers to a large group of diseases that cause inflammation of the blood vessels. Both arteries and veins are affected. It causes changes in the blood vessel walls, including thickening, weakening, narrowing or scarring. These changes can restrict blood flow, resulting in organ and tissue damage. There are many types of vasculitis, and most of them are rare. Vasculitis might affect just one organ or several. The condition can be short-term (acute) or long-lasting (chronic). Vasculitis can affect anyone, though some types are more common among certain groups. Depending on the type people have, people may improve without treatment. Some types require medications to control the inflammation and prevent flare-ups. Signs and Symptoms of Vasculitis: The signs and symptoms of vasculitis vary greatly. They’re often related to decreased blood flow throughout the body. The symptoms of vasculitis vary greatly from person to person and depend upon the organs affected and the severity. Affecting the lungs can cause shortness of breath and cough. Affecting the heart can cause congestive heart failure. Affecting the brain can cause headaches, confusion, seizures, stroke, paralysis, numbness, and lightheadedness. Affecting the kidneys can cause kidney failure. 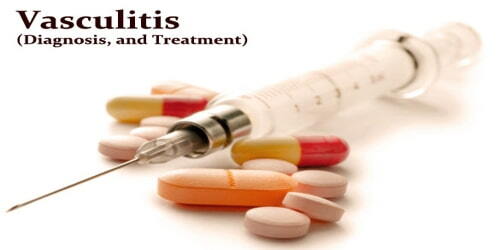 Infections: These include serious and life-threatening conditions, such as pneumonia and blood infection (sepsis). Vision loss or blindness: This is a possible complication of untreated giant cell arteritis. A blood clot may form in a blood vessel, obstructing blood flow. Rarely, vasculitis will cause a blood vessel to weaken and bulge, forming an aneurysm (AN-yoo-riz-um). 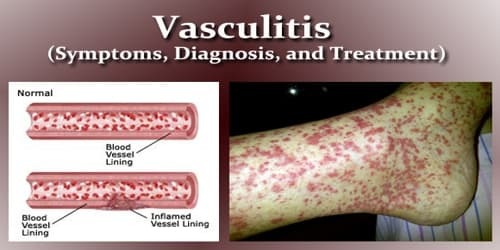 Treatment for vasculitis depends on several factors, including what type of vasculitis the person has, the severity of their symptoms, their age, and their general health. Sometimes, as may be the case with Henoch-Schonlein purpura, the condition clears up without medical treatment. Typically, cortisone-related medications, such as prednisone, are used. Additionally, other immune suppression drugs, such as cyclophosphamide (Cytoxan) and others are considered. Additionally, affected organs (such as the heart or lungs) may require specific medical treatment when the disease is active. Sometimes, vasculitis causes a balloon-like bulge (an aneurysm) to form in the wall of a blood vessel. This bulge may need surgery. Blocked arteries also may require surgical treatment.